Simply defined, spinal cord trauma is damage or injury to the spinal cord. 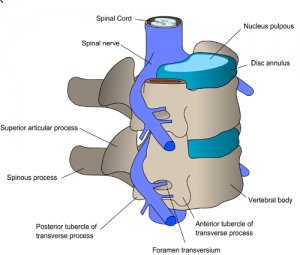 Spinal Cord Trauma can cause the patient severe back pain. The reason for spinal cord trauma may vary from person to person and it can take place due to an injury to the cord itself or due to a disease in the tissues, blood vessels as well as surrounding bones in the spinal cord. The symptoms as well as signs of spinal cord trauma can vary depending upon the location of the injury. However, there are certain symptoms that are usually found in a patient who suffers from spinal cord trauma at any level (cervical, thoracic and lumbar region of the spinal column). It is important that the treatment of spinal injuries be started right away as the time lapse between the treatment and injury can have a profound effect on the outcome. Surgery is considered in extremely severe cases. For example – to remove foreign objects or disk and bone fragments and to fuse broken spinal bones. Call a doctor immediately if you suffer from a neck or back injury and lose feeling or movement in the injured area. This is a medical emergency and you need immediate help.